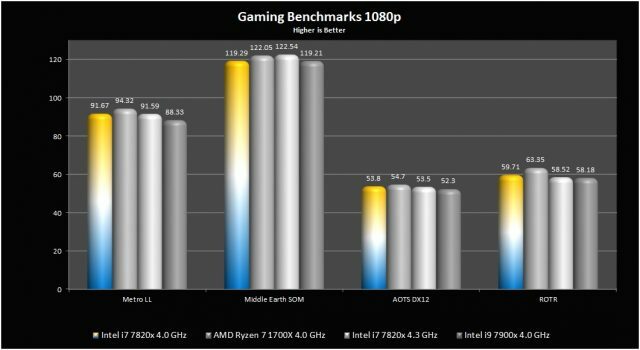 Intel’s announcement of the X299 (Basin Falls) High-End Desktop (HEDT) platform initially had a few people shaking their heads, myself included. It all seemed very rushed and many claimed it to be a response to the recent Ryzen/ThreadRipper line from AMD. Whether it was or wasn’t, we’ll likely never know. What we do know is that it covers a broad line-up of CPUs from the quad core i5 all the way up to the 18 core/36 thread i9. This is the first time since LGA 1366 that Intel has included quad-core variants on their HEDT platform and many aren’t quite sure what to make of it. 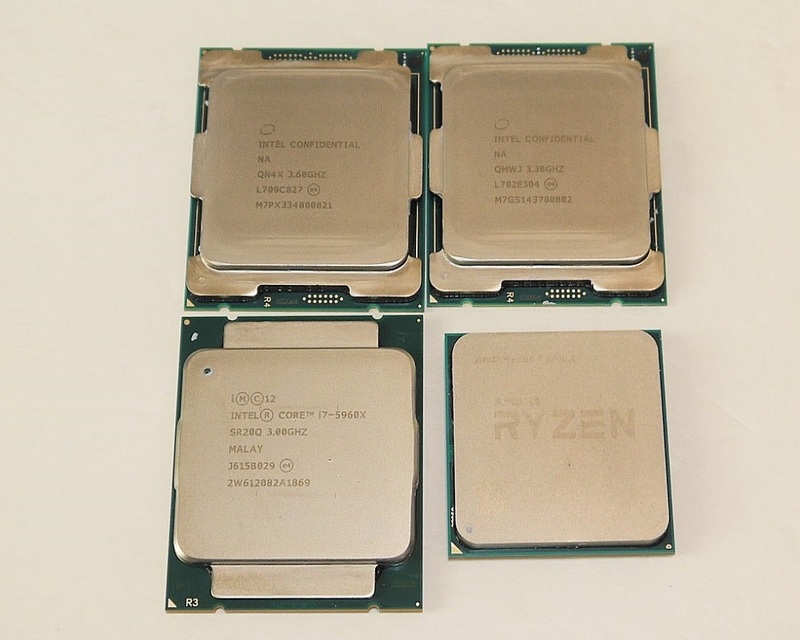 Today we’ll be having a closer look at the 8 core/16 thread SkyLake-X Core i7 7820X and how it measures up to its bigger brother the i9 7900X as well as some comparisons to the AMD R7 1700X. 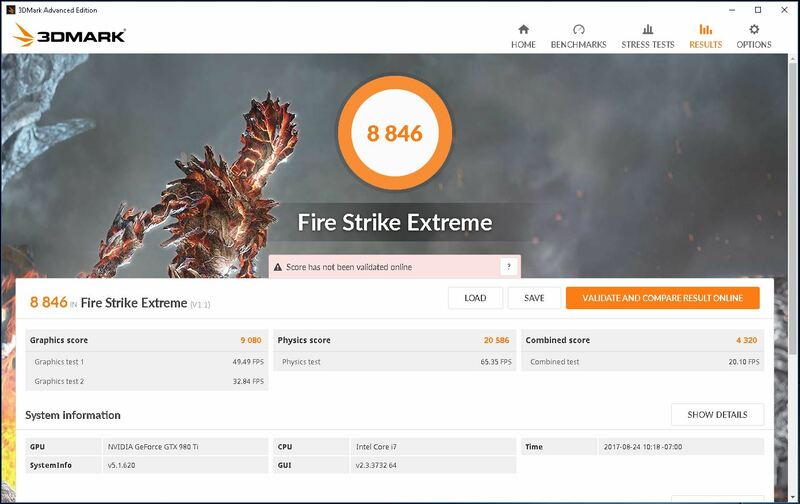 Right off the top, I can tell you the 7820X has one big advantage: its base speed and overclocking headroom when compared to the AMD Ryzen CPUs which quickly run out of steam at the 4.0 GHz mark. This is already 300 MHz behind the 7820X’s all core turbo speed. Below is a list of specifications for the 7820X taken from Intel’s website. Skylake-X processors are based on the 14 nm Tri-Gate 3D production, using a 64-bit instruction set. The 7820X supports quad-channel DDR4 2666 MHz as the standard and up to 128 GB of RAM. You may notice that the L3 cache size has been reduced significantly compared to the 7820X’s Broadwell predecessor. There’s a good reason for that: Intel has reorganized their cache hierarchy in favor of additional L2 cache. The intention of the additional L2 cache (1 MB versus 256 KB per core) is to reduce calls to the L3 cache which is much slower, which in essence should improve efficiency. The i7 7820X comes with 8 cores and 16 threads with a base clock speed of 3.6 GHz. This is a 400 MHz bump up over the i7-6900K. The turbo frequency is 4.3 GHz on all cores and 4.5 GHz on two cores thanks to Turbo Boost 3.0. So far, on the motherboards I have tested, the CPU basically runs at 4.3 GHz all the time. The TDP of the 7820X is 140 W, so a decent cooling solution is required if you want to run the CPU to its full potential. Compared to its predecessor, the 7820X has been pared down to 28 on-CPU PCIe 3.0 lanes, 12 less than the 6900K. Still enough for dual graphics but limited to an x16/x8 configuration. Intel has also decided to use a TIM-based solution between the die and IHS. I can see how this makes good “business” sense but it does open the door for inconsistency and is a weaker thermal solution than solder which they used in the past for their Extreme series CPUs. For more information on the Basin Falls platform, you can have a look at EarthDog‘s review of the i9 7900X. He gives a bit more detail from the Intel press release. 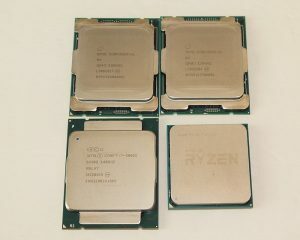 Below, I have included some shots of the CPUs I used for testing. 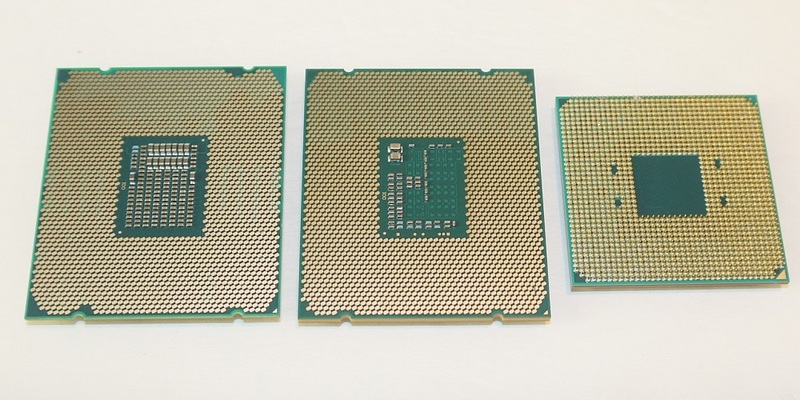 You’ll notice in the picture to the right, the top two CPUs both look identical. Engineering samples from Intel typically lack the retail labeling and the easiest way to tell the difference are the core clock speeds which are printed on the IHS. 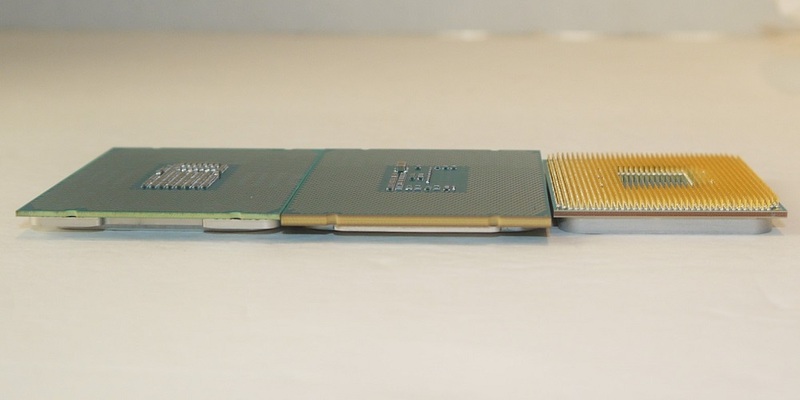 In that same picture, you’ll notice the difference between the SkyLake-X and Haswell-E IHS. The contact area is actually a bit larger on the 5960X which houses a slightly larger die than the Skylake-X. The Ryzen CPU really isn’t that much smaller it’s just the PCB size that makes it look that way. The Ryzen PCB only needs to accommodate 1331 pins compared to the 2066 pads on the Skylake-X. One other note here on the PCB, look at the difference between the 5960X and the 7820X. It’s quite obvious the PCB of the 5960X is at least twice the thickness, if not more, compared to the new 7820x. 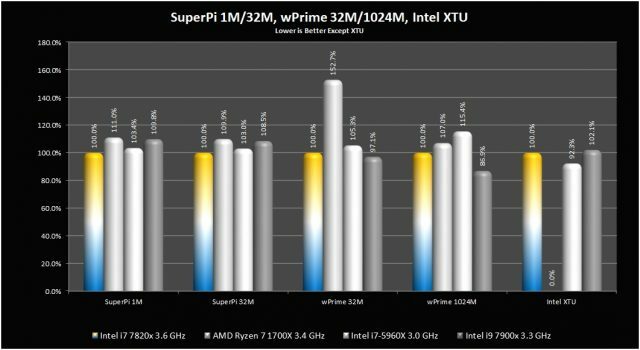 The data we have gathered will give us a great idea of the i7 7820X’s performance both at stock (no turbo), and equal clock speeds to see IPC performance increases between Haswell-E and Skylake-X as well as a comparison to the AMD Ryzen CPU. All benchmarks were run with the motherboard being set to optimized defaults (outside of some memory settings which had to be configured manually). 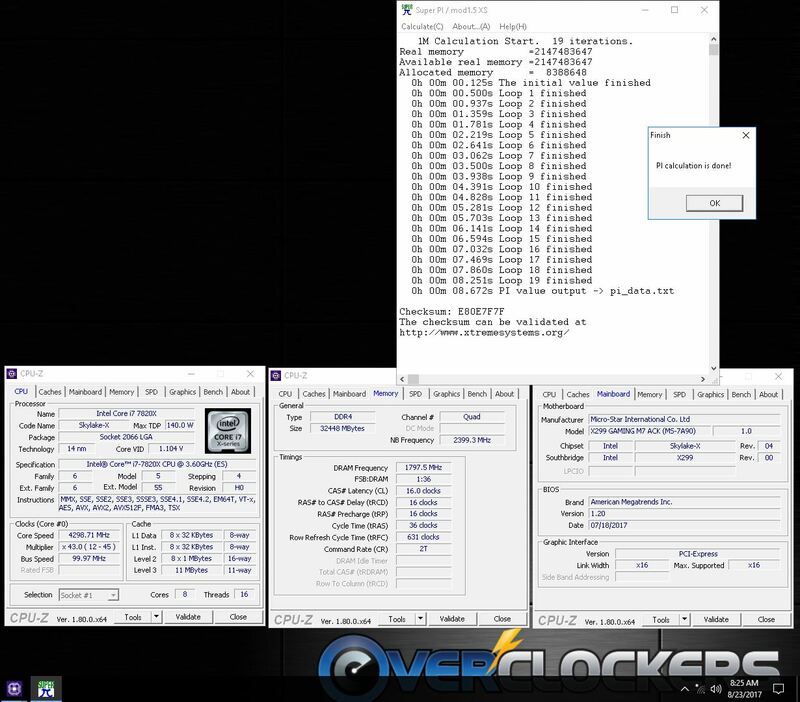 When “stock” is mentioned along with the clock speed, it does not reflect the boost clocks, only the base clocks. I tested this way as it seems motherboards are different in how they work out of the box. The motherboards I have set all cores at the max turbo (4.3 GHz) for the CPU while other boards follow the Intel Turbo specification. So, it is more of a “run what you brung” type of testing for stock speeds. 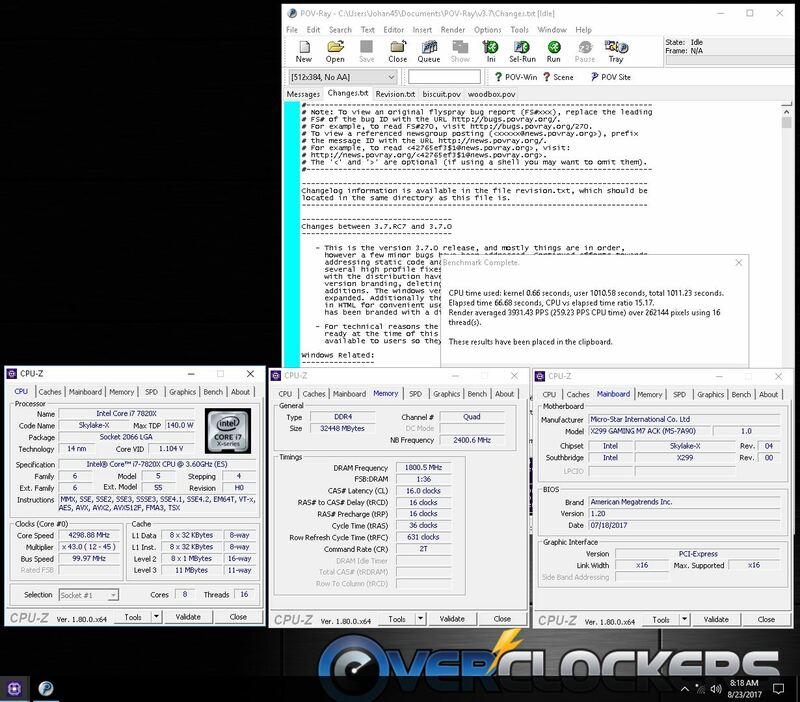 The second round of testing was done at 4.0 GHz to even the playing field and give an idea of how the CPUs compare directly clock-for-clock. I’ve also added results from the i7 7820X at 4.3 GHz to give an idea of real-world performance. This is the max, all-core turbo frequency which is where the CPU runs when left on default settings in BIOS. All game tests were run at 1920×1080 and 2560×1440 with all CPUs at 4.0 GHz. Please see our testing procedures for details on in-game settings. 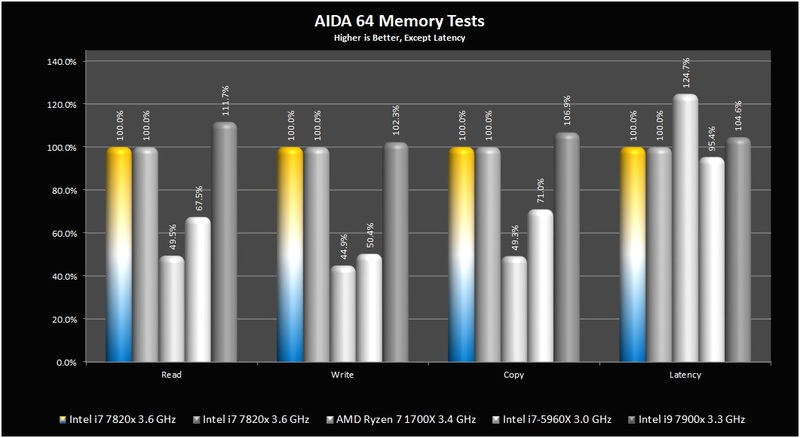 Stock testing using the AIDA64 Engineer software is below. 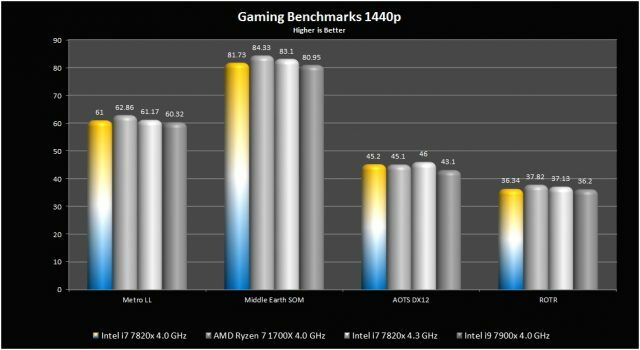 You’ll see a couple of large results from the AMD CPU, specifically the Hash and AES benchmarks. Both of which are used for security features found in the server segment. 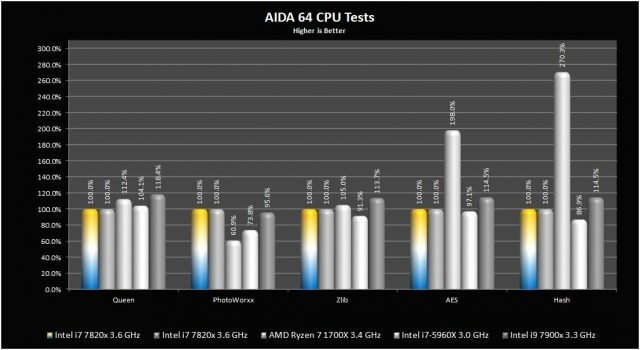 The 5960X managed to keep up in a couple of benchmarks but the newer architecture is showing some nice gains in CPU and FPU performance. Results are pretty similar here in the AIDA64 FPU test suite. 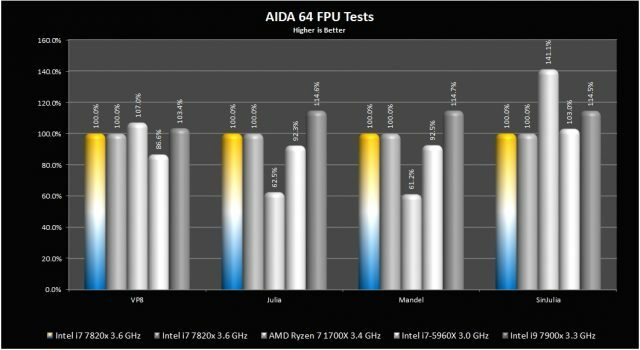 The Ryzen pulled another lead in SinJulia and a slight one in VP8 but the other two tests show the 7820X with a 40% gain. Once again, we see a slight lead over Haswell-E. Here we can really see the generation gap. Intel has made some impressive gains in memory throughput due to design and an improved IMC. 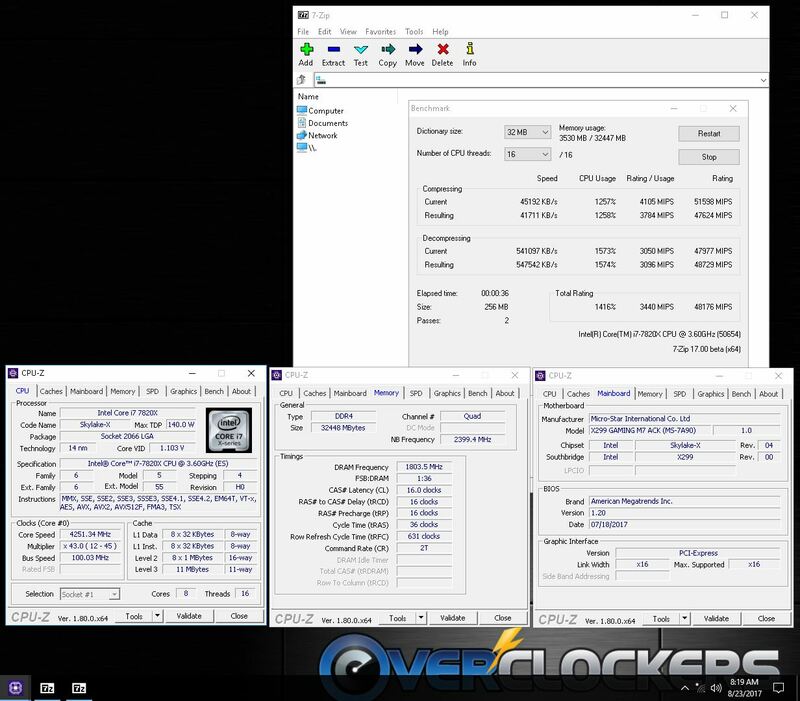 The Skylake CPUs were able to handle much faster RAM speeds compared to the 5960X which was limited to the 3000 MHz range for stability. The 7820X, on the other hand, ran stable at 3600 MHz. As for Ryzen, first off, it’s the only CPU here which isn’t using quad-channel memory and they also have some difficulty with higher RAM speeds, that’s why testing was done at 2933 MHz for this CPU. Moving on to some real world benchmarks, it’s easy to see how the extra cores of the 7900X make a difference even though the 7820X had a 300 MHz speed advantage. Here you’ll see in SuperPi, the added base speed of the 7820X gave it a bit of an edge over the 7900X but curiously so did the 5960X. This has to be due to the cache restructuring. As for AMD, these benchmarks have never been their strong suit. 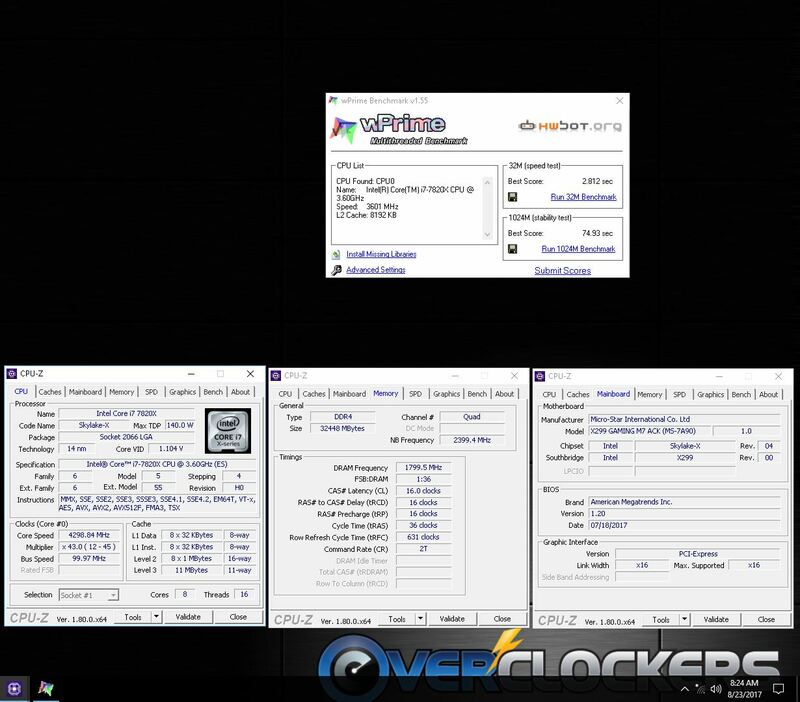 Just a reminder, all tests from this point forward have all CPUs running at 4GHz instead of their stock speeds. With the exception of the i7 7820X which has 4.0 GHz and 4.3 GHz results. For the most part, the results were very consistent across the board. 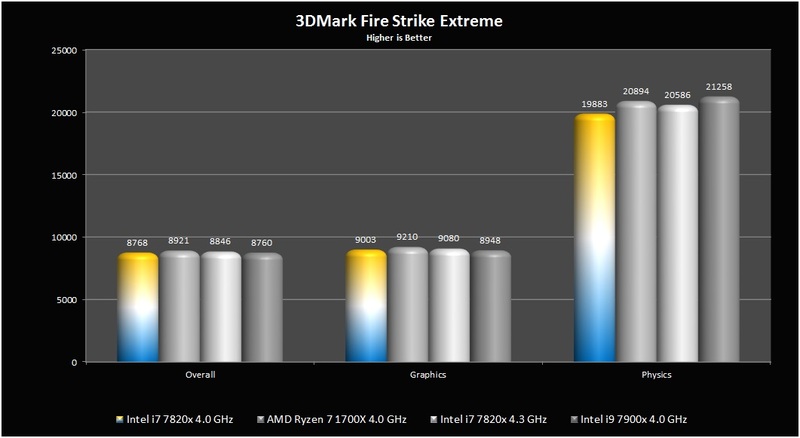 Even the slight speed increase of the 7820X really didn’t make much if any difference. As for the synthetic benchmark, 3DMark Fire Strike Extreme the results look very similar to the gaming graphs above. In our head to head results, we ran all of the systems at 4 GHz. This shows the differences in IPC and cores directly. Just like the gaming tests above, there’s an included result for the 7820X at 4.3 GHz. 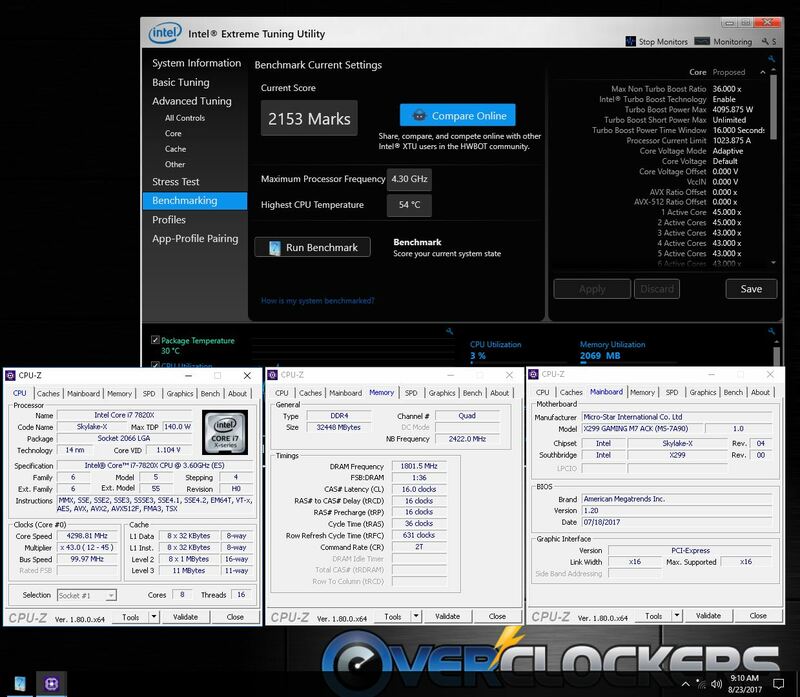 You’ll notice that 300 MHz boost translated to a six percent plus performance increase in the following benchmarks and the i7 7820X still has plenty of overclocking headroom. 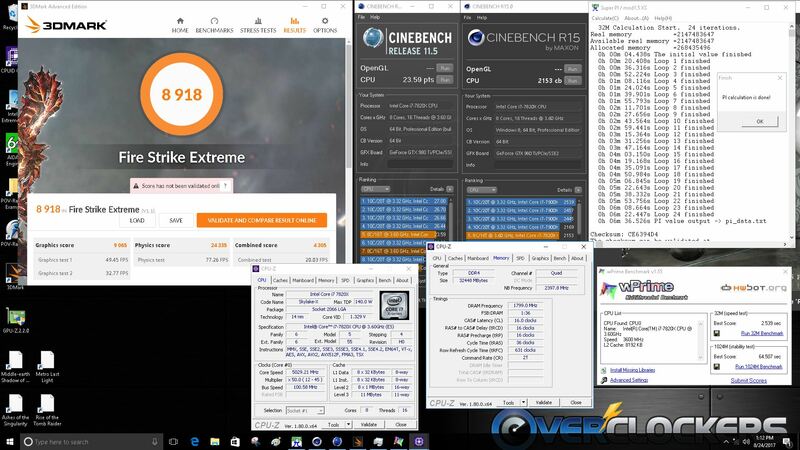 As expected, the 10 core 7900X really shows its strength in the multi-core benchmarks. 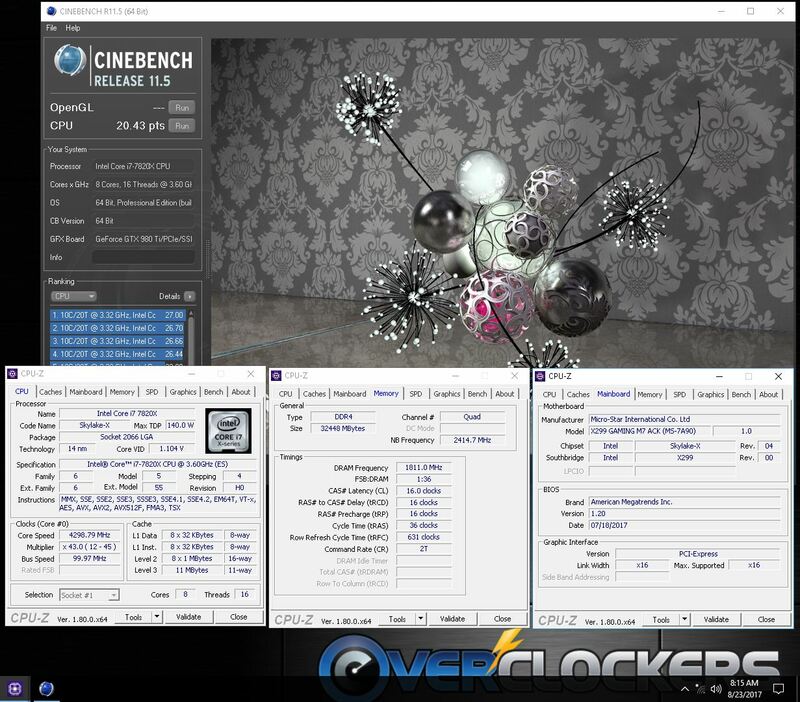 The Intel i7 7820X overclocked quite well. The only real issue I had was trying to control the heat that the CPU was putting out. No doubt, this is partly due to the less than optimal thermal interface choice of paste instead of solder — as the voltage was raised it quickly showed its weakness. 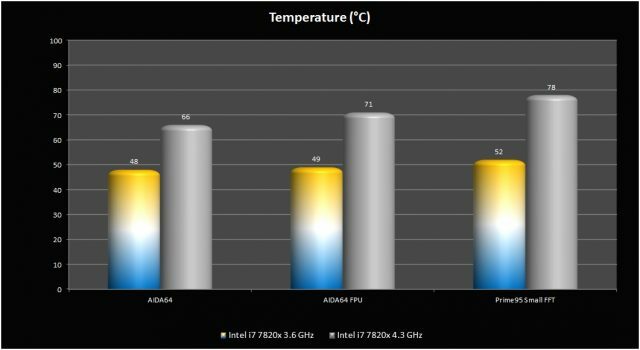 I could get the 7820X stable with AIDA64’s stability test at 4.7 with 1.26 V at 88°C but even then Prime 95 proved to be way too strenuous and the temperatures quickly hit 100°C and the test was terminated. I was able to set a negative offset on the multiplier in BIOS of two which forced the CPU to drop from 4.7GHz to 4.5GHz when it encounters AVX instructions. With this compromise, it was able to run Prime 95 but still well over 90°C and pushing the limits of the EK Predator 360 XLC I was using to cool it. Pushing the limits of the overclock I could manage a speed of 5.0 GHz at 1.33 V, stability testing at this setting was out of the question without better cooling but I was able to run a wide array of benchmarks as you will see in the picture below. I also bumped up the RAM speed to 3800 MHz CL16. There’s one benchmark I ran that’s not included in the screenshot below which is HWBot X265, and is a very tough benchmark. I checked the power consumption while this benchmark was running and the system peaked at 440 W.
The power consumption of the i7 7820X at stock with turbo boost active really wasn’t surprising. 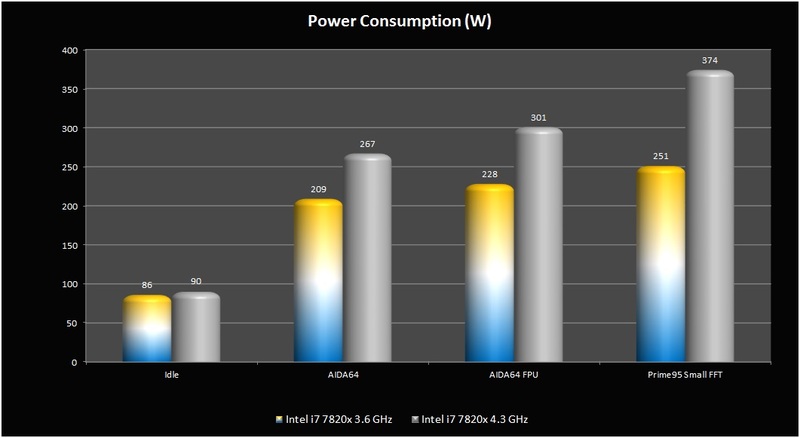 I’ve worked with a number of “power hungry” CPUs in the past and the 7820X sits right about where it should. The Prime95 test pushed it to 374 W from the wall for the system. Add in a video card and you’d want a 700 W power supply to give it some breathing room. If you were going to run multiple cards or push the system into the higher limits of its speed. I would suggest a 1000 W power supply as a minimum. The temperatures were fine at stock maxing out at 78°C using the Prime 95 small FFT test. Once I started overclocking, it was easy to see my 360 mm AIO was no match for the heat this CPU could generate. With decent cooling, I wouldn’t expect much more than 4.5-4.7 GHz for a top-end 24/7 CPU speed. Overall, the i7 7820X is a great improvement over the Haswell architecture in most cases. It’s a pity I didn’t have an i7 6900K (Broadwell) to compare the two since they’re only one generation apart and there were some performance gains over Haswell. The main reason I never invested in one and that was the fact they had very limited overclocking potential. The new Skylake-X CPUs don’t seem to have that problem if you can manage the heat they produce. I’m still a bit disappointed with Intel’s decision to use TIM under the IHS compared to solder which the previous generations of “Extreme” Intel CPUs used. I realize that “technically”, we shouldn’t be overclocking the CPU in the first place but where’s the fun in that? The thermal interface material Intel uses isn’t really optimal for extending the overclocking range of their CPUs but it works just keep that in mind when overclocking as temperatures can quickly get out of control even with very good cooling. Intel has also improved on their turbo technology, offering higher boost overall and a two core maximum boost versus the single core boost in past generations. 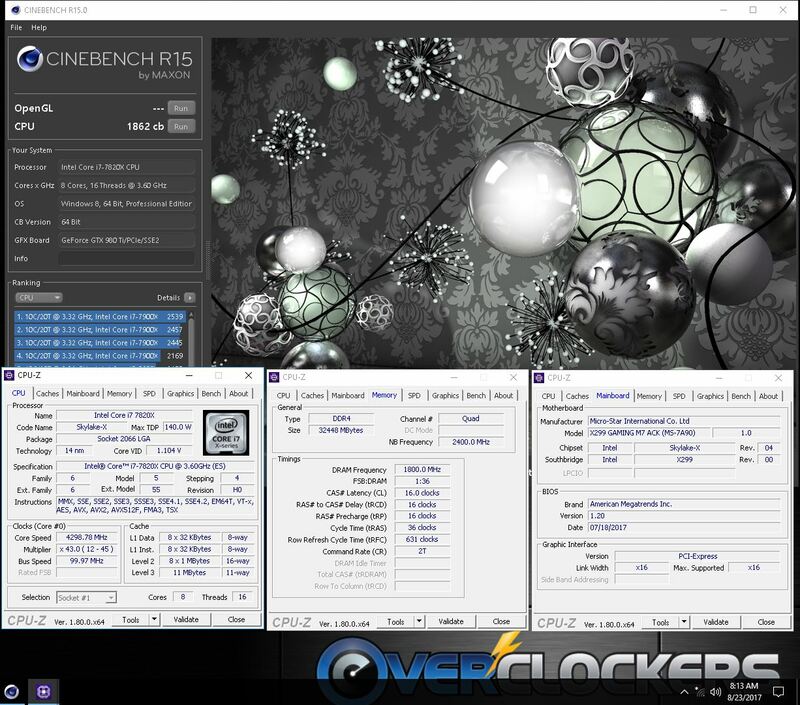 The Core i7 7820X has a base clock of 3.6 GHz but the two motherboards I have tested it in both run the CPU at the full boost of 4.3 GHz with peaks of 4.5 GHz on two cores. To be honest, I rarely saw the CPU at 3.6 GHz in effect making 4.3 GHz the “new” base speed. I was a bit surprised at the change in PCI express lane count. Previous generations allowed up to 40 lanes which are perfect for dual graphics card setups, allowing X16 for both cards and plenty of bandwidth left for peripherals. The new 7820X is reduced to 28 PCI express lanes, which limits the lanes allowed for graphics cards to X16 and X8. 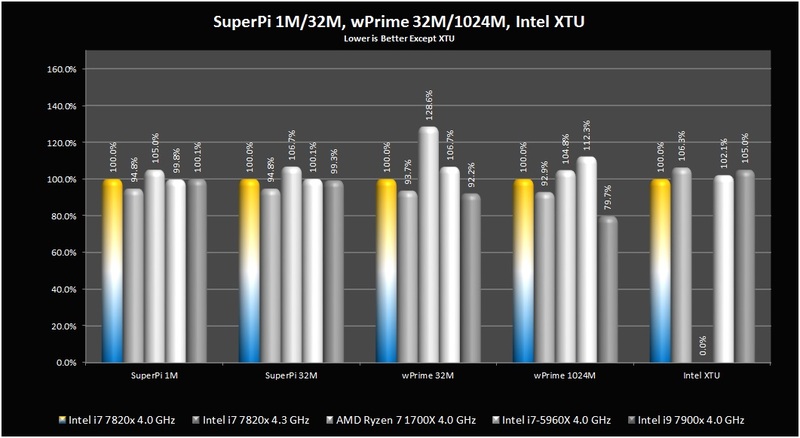 The loss of performance really is quite negligible but I still have to question Intel’s logic behind that decision. We also have a new cache hierarchy with the new Skylake-X CPUs. They give up a bit of L3 cache for a lot more L2 cache, which should in theory help by reducing the calls to the L3 cache. I think this is very dependent on the process and how it accesses the CPU – Overall we have seen a slight performance hit in some situations and a benefit in others. Gaming seems to be one of those that have taken a slight hit with the reduced cache. Comparing some i7 7700K results from the review of the R7 1700X to the 7820X and 7900X they always seem to lag but only by a slight margin of a few FPS at the most. Now for the really good part. 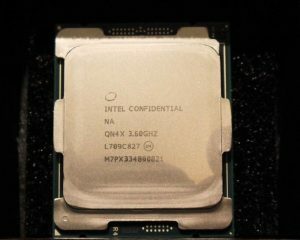 Intel has priced the i7 7820X well below its eight-core predecessors with an MSRP of $599. The 6900K and 5960x came in with an initial MSRP of $1100 and $1000 respectively. This is a 40%+ drop in price for a CPU with better performance. This has to be a response to AMD’s introduction of the Ryzen line-up of CPUs. They have the eight core, 16 thread CPUs and offer a lower price. 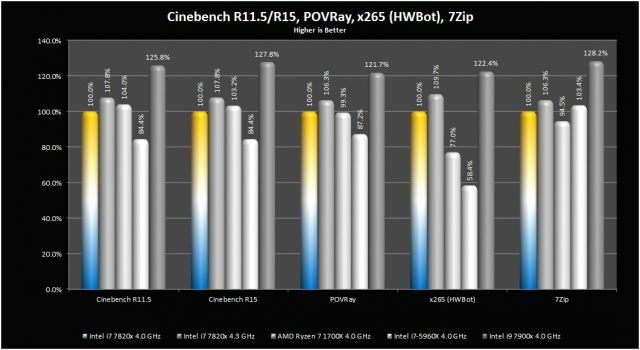 AMD’s Achilles heel is their top speed, with all variants maxing out around the 4.0 GHz mark; the 7820X, on the other hand, will get closer to 5.0 GHz. 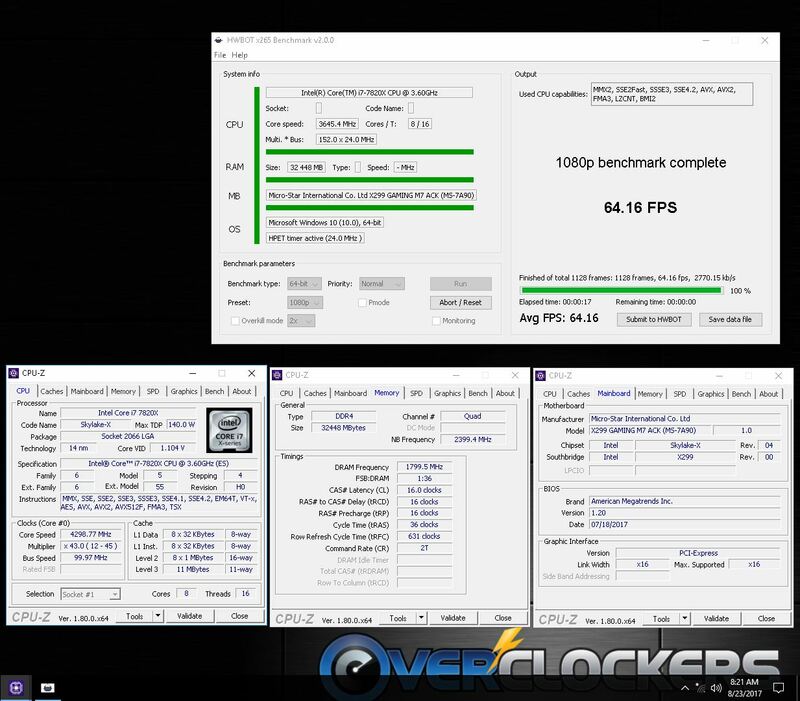 Overall the 7820X is a great CPU, tons of performance and lots of overclocking potential. I have seen members in the extreme crowd already topping 6.5 GHz. I also really like the pricing this generation. Seems much more realistic and likely will help sales tremendously. Intel has done a great job here and I can easily give the 7820X the Overclockers stamp of approval. 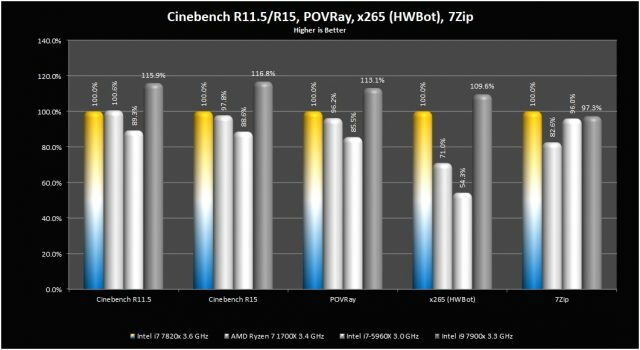 Something is quite weird on some heqd to heqd benchmarks: the 7820X@4GHz shozs the same results as the 5960x@GHz (XTU, and SuperPi) with even an extra 2.5% performance for the latter in XTU. Really a powerful CPU but may be too overpowered for gaming purpose. Thank you Shawn, nice work. I have read your informative thread regarding i7-7820X overclocking and I would like to say first of all, thank you very much for writing the thread itself. My PC runs the same CPU(i7-7820X) with a Titan Xp Collectors Edition. 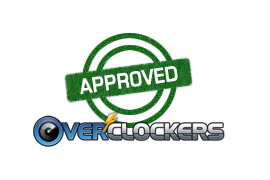 I never tried overclocking before in my life, but I really would like to try it on my system. Do you think you can help me out with this? I need a real expert opinion on this matter, as my PC is not a cheap one and I am not ready to risk it without a help of someone who really knows what they are talking about.